A couple of weeks ago I was very daring and I bought a single crochet hook and a ball of yarn. Hours of online research later (mainly Pinterest! ), I have taught myself to crochet and have made items that I am already super pleased with! The first was the hat that appeared in my #sundaysevens blog post. 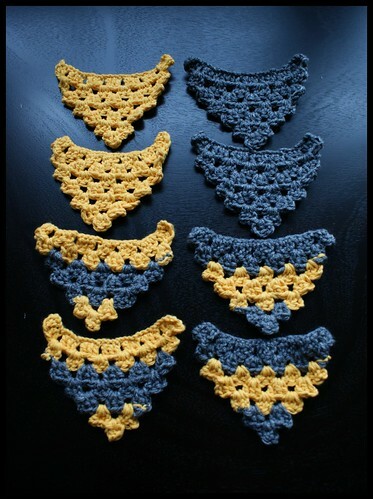 The next thing I had my eye on was some crochet bunting. The tutorial/pattern was very basic and I was a little dubious that it wouldn’t be very good. However, it was easy to follow and produced some lovely little triangles that could be turned into bunting. Our apartment is rented and furnished through the housing company that is linked with the company that Adam works for. It is lovely, modern and simple; just the right size for us but the colour schemes are not ‘us’. We like little pops of colour! Yes, there are different colours around the apartment but they are mainly on the cream and brown spectrum. This makes me a little sad. So a few little projects popped into my head and here I am giving our apartment a little makeover! I made the 8 bunting triangles; 2 of each design; some plain and some striped. 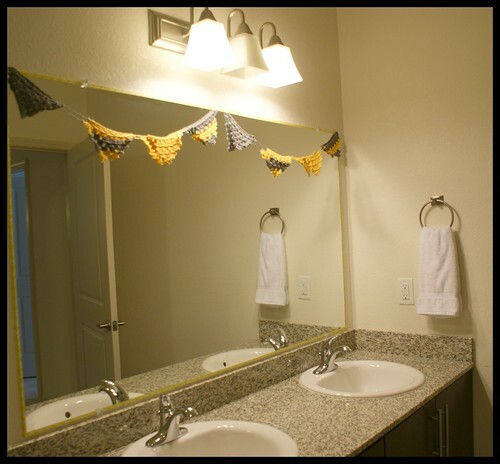 I measured the mirror and spaced the bunting out across the tape measure. 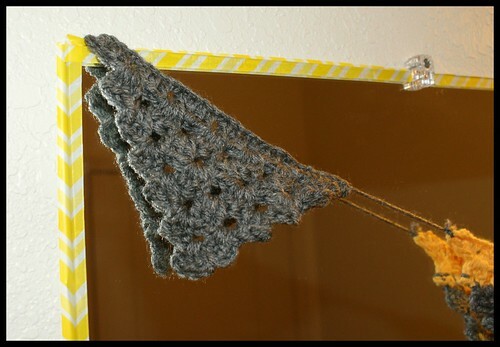 I then used the scraps of yarn to join the triangles together at the corners. Thanks! I will be adding a few more bits soon too! 🙂 Colour is the way forward! Cute! Cream, brown and a lack of bathroom windows makes me sad too lol! Very cute. Congrats on starting the crochet journey–now you’re hooked! !